See the report from our latest water program, Smart Water Now, in partnership with Itron here. Water is the lifeblood of modern society. Our lakes and rivers supply our water and are a key, yet often overlooked, contributor to our local economy and quality of life. Water feeds us, cleans us, entertains us (recreation) and is integral to the production of energy and economic vitality in the Region. Our water comes from various lakes, rivers, and streams in our area, including Lake Norman or Mountain Island Lake, which are fed by the Catawba River within the Catawba-Wateree River Basin. 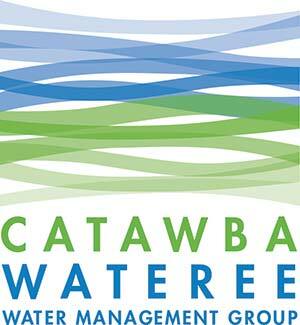 In 2006 nearly 420 million gallons were withdrawn from the Catawba-Wateree River Basin by Charlotte Water to support our community’s water and energy needs. The Catawba-Wateree River Basin includes the Catawba-Wateree River which flows approximately 320 miles from its headwaters in the North Carolina mountains until it merges with the Congaree River just upstream of Lake Marion. The basin includes approximately 5,000 miles of waterways and it includes portions of 24 counties in two states (North Carolina and South Carolina). The basin includes eleven lakes which were constructed by Duke Energy in the twentieth century to produce electricity. It also includes one National Wilderness Area (Linville Gorge), a National Park (Congaree National Park), the Catawba Indian Reservation, and many state and local parks. The Region’s drinking water and wastewater systems are managed by a variety of Public Utilities across the basin. For example, Charlotte’s water is managed by Charlotte Water, our local public utility. Your drinking water in Charlotte-Mecklenburg originates from Lake Norman and Mountain Island Lake. Raw water is gathered by one of three water treatment plants, where it is filtered and disinfected to become clean drinking water. It is then pumped through more than 4,200 miles of water pipes directly to your home. Each year, Charlotte Water performs more than 150,000 tests to ensure the safety and quality of our drinking water. Your water regularly meets and exceeds all state and federal drinking water standards. The wastewater system, sometimes called sewer, is an independent water disposal system (i.e., it is not connected to the drinking or stormwater systems) that takes used water from your house or your business, cleans it, and puts it back in the environment. When you take a shower, wash clothes or flush a toilet, the wastewater generated from these activities in your home flows through the wastewater pipe system to one of five wastewater treatment plants in Mecklenburg County. At those facilities, the wastewater is treated to remove solids, bacteria, nutrients and other pollutants. After extensive testing and monitoring, the treated water is discharged back into a creek, which eventually flows into our rivers. The removed solids are treated further and then, through a stringently regulated process, are recycled for use as fertilizer on farmers’ fields. Stormwater is rainwater that doesn’t soak into the ground. Stormwater runs off rooftops, driveways and yards, down street curbs and into storm drains. Storm water runoff can create issues with water quality (pollution) and quantity (flooding). Storm drains don’t only remove water from the streets. They also take in pollutants picked up along the way as water flows across the land. Storm water is not sewage; it is not cleaned at a treatment plant. Pipes that carry storm water empty directly into local creeks and lakes. A typical city block generates five times more runoff than a wooded area of the same size. In the United States, we have easy access to some of the safest treated water in the world—just by turning on the tap. We wake up in the morning, take a shower, brush our teeth, grab a cup of coffee and head out for the day. It goes without saying that water is an important part of our daily lives and we use it for a wide variety of purposes. 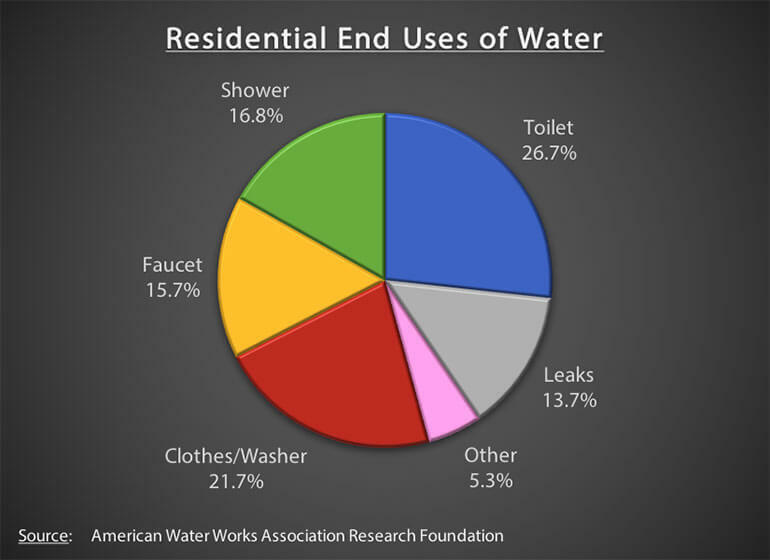 However, do we really understand how much water we use? In Charlotte-Mecklenburg County, the Residential and Commercial sectors comprise 91% of all metered water use – with the Residential sector responsible for 67% alone. The average American family uses more than 300 gallons of water per day at home and roughly 70 percent of this use occurs indoors. Nationally, outdoor water use accounts for 30 percent of household use yet it can be much higher in drier parts of the country and in more water-intensive landscapes. Clean and plentiful water is essential to our community, and our Region has a problem. Without a significant, coordinated effort to manage water availability and consumption in the area, this generation could see a time when there will not be enough water to support our growing city. Not enough water to support new jobs. Not enough water to produce more electricity to drive new industry. Not enough water to ensure the quality of life we currently enjoy. Envision Charlotte is committed to working with local stakeholders to address the complex issue of sustainable water resources. Our participation is focused on supporting efforts of Charlotte Water, our local water utility, and the Catawba-Wateree Water Management Group (CWWMG). The CWWMG is a regional collaboration of stakeholders tasked with addressing regional water issues and is working diligently to insure that we have bountiful, clean and safe water to support the long-term needs of our community. In May of 2014, the CWWMG completed a basin-wide study of water use and water availability in our area (The Master Plan). The study identified the challenges associated with a limited water supply and recommended ways to improve water availability going forward. To determine when critical levels of water availability could occur, the Master Plan included detailed future water withdrawal and return projections through 2065 (~50 years) for public water, power generation, industrial users, and agricultural and irrigation uses. These water use projections were then extrapolated to the year 2115 for water modeling purposes. The Master Plan’s initial step in evaluating water use and availability was to define a Baseline Scenario that reflects the best estimate of water availability in the Charlotte area going forward. The Baseline Scenario assumes existing water infrastructure and the most recent data from drought periods, along with projections on water usage associated with current population growth trends and climate change. Under the base scenario, Charlotte could reach an unsustainable level of water usage around 2060, less than 50 years from today. Incorporates current water supply infrastructure. Integrates fresh data from 2007-2009 drought. Includes a bottom-up analysis of future water usage that is consistent with population growth of approximately 1.5% annually. Assumes a modest impact from climate change including a gradual temperature increase of 0.6oF per decade (which corresponds to an 11% increase in lake system evaporation through 2065) and no change in average precipitation annually. The Master Plan assumes a Baseline Scenario but also examines the impact on local water availability from changing assumptions and implementing water management strategies. In the figure above, we summarize some of the results from this analysis. What if Population Growth (and associated Water Usage) is Higher than Expected? The Baseline Scenario includes a bottom-up analysis of future water usage that is consistent with population growth of approximately 1.5% annually. This growth assumption is on par with historic growth in our area over the last 40 years and projections by the Census Bureau. If growth were to exceed this level – the Master Plan analyzes growth of approximately 1.8% instead of 1.5% under the Baseline Scenario – the Basin could experience unsustainable water usage levels as soon as 2030. What if Climate Change has a Greater Than Expected Impact? Research findings suggest that climate change should be considered in water modeling analysis. Potential impacts to water supply resulting from climate change include changes in precipitation (amounts and intensity), increases in evaporation and transpiration (water usage by plants), and changes in water demand, among others. The Baseline Scenario assumes a modest impact from climate change including a gradual temperature increase of 0.6oF per decade (which corresponds to an 11% increase in evaporation through 2065) and no change in average precipitation annually. The Master Plan analysis included a scenario where a gradual temperature increase of 0.5oF per decade (which corresponds to a 9% increase in lake system evaporation through 2065) and a 1.8% reduction in average precipitation annually (-10% reduction through 2065). Under this more negative scenario, the Basin could experience unsustainable water usage levels as soon as 2050. As part of the Master Plan, the CWWMG put together a strategy for extending the life of a sustainable water supply for the Region into the next century. The plan incorporates a 20% reduction in water usage by the public and proposes to increase the availability of water through various water management changes. The public (residents and businesses) account for about half of all the water used in our area. It follows that any attempt to extend the sustainability of our water supply must include efforts to reduce public water usage going forward. 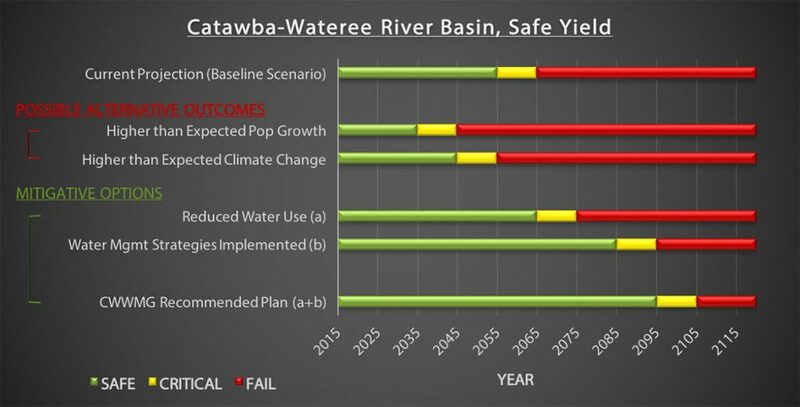 The Master Plan calls for a 17.8% reduction in public water supply withdrawals from the Catawba-Wateree River Basin. Given its size and proximity in the Basin, the City of Charlotte’s share of the overall reduction goal is 20%. Every citizen is called on to reduce their water usage by this amount. If we all chip in to achieve this goal, water sustainability can be extended by approximately 10 years beyond the Baseline Scenario. Fortunately, the efforts of the citizens of the Region to conserve water will not be in a vacuum. In addition to the goal of a notable reduction in public water usage, the CWWMG is embarking on multiple water management strategies to expand water availability and improve drought response. 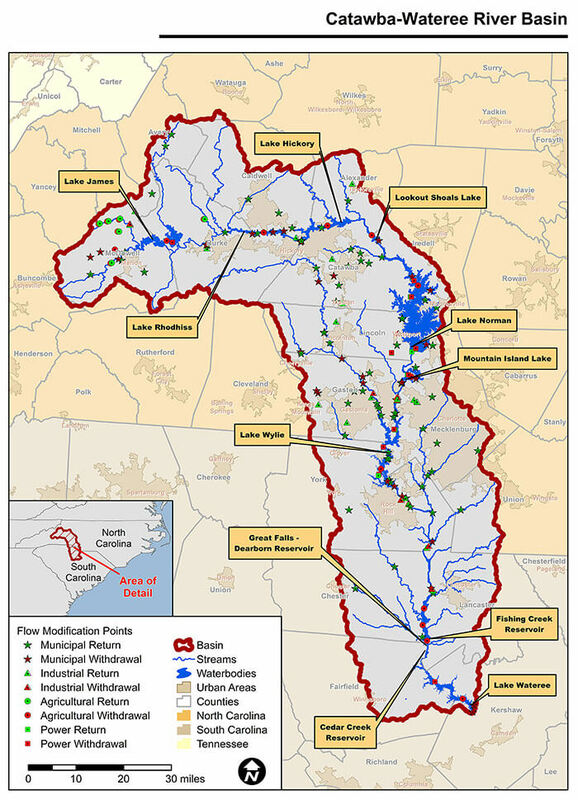 Actions include lowering water intakes in various lakes in the Catawba-Wateree lake-system, raising summer lake operating levels at Lake James, Lake Norman, and Lake Wylie, and making flow reductions faster at lake system dams as the various stages of the regional drought procedure (called Low Inflow Protocol) are implemented. These water management strategies could potentially add 30 years to the sustainability of our water supply. CWWMG’s Master Plan recommends a combination of both reduced water use by the public (demand reduction) and water management strategies (supply increases and drought response improvements) as the optimal course of action. A combination of these efforts is estimated to extend water sustainability in our Basin by 40 years through 2100. Only through the combination of efforts of all stakeholders can we ensure a safe and plentiful supply of water is available for our children and the next generation of citizens.